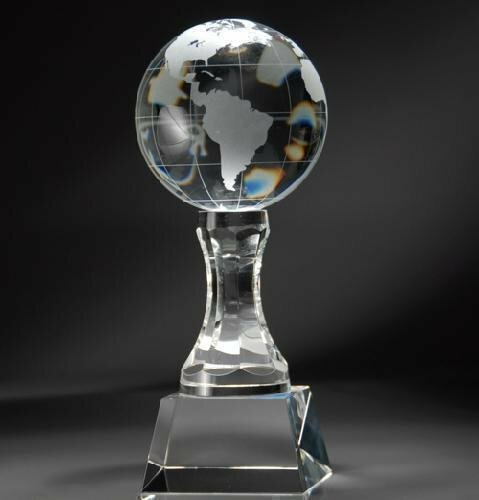 Globe Awards are great for airlines, international companies and missions related awards. 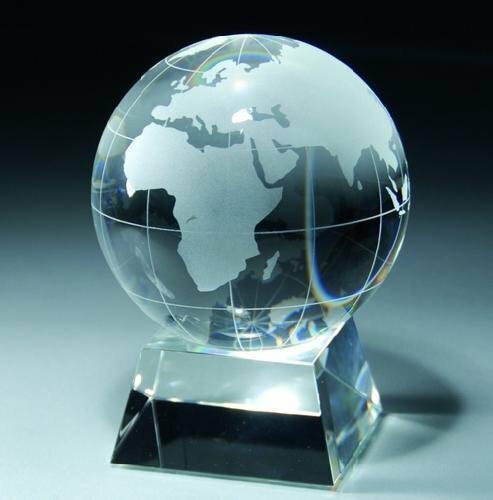 The Crystal Globe is an elegant choice for a crystal award or personalized gift. The globe can be spun on the base. It is an excellent choice for recognizing the achievements and accomplishments of special people and outstanding business partners. This beautiful awards is personalized with an engrave silver aluminum plate. 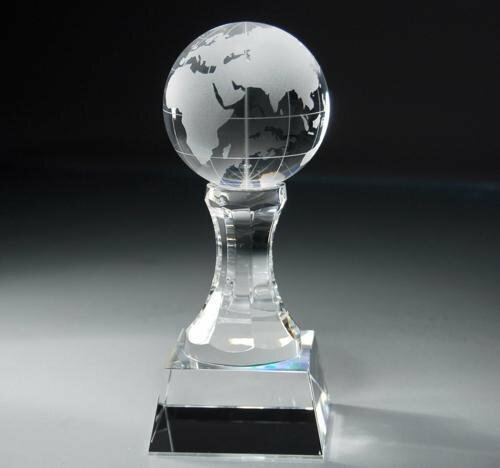 The Crystal Globe is an elegant choice for a crystal award or personalized gift. The globe can be spun on the base. It is an excellent choice for recognizing the achievements and accomplishments of special people and outstanding business partners. This beautiful award is personalized with an engrave silver aluminum plate. The Crystal Globe is in a Semi-Meridian Holder on a black glass base. It is an elegant choice for an award or personalized gift. It comes with a black aluminum plate with silver lettering and border. 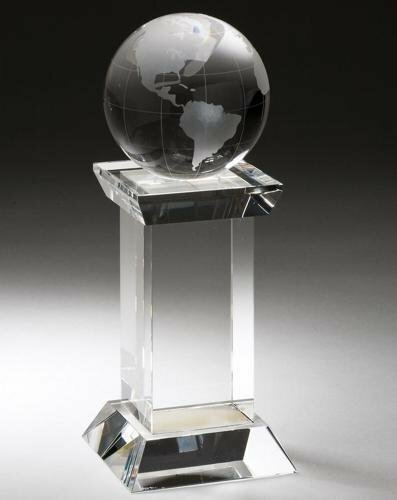 Crystal Globe Pedestal Award is an elegant choice for a crystal award or personalized gift. It is an excellent choice for recognizing the achievements and accomplishments of special people and outstanding business partners. The crystal trophy comes with a scratch engraved silver aluminum plate. 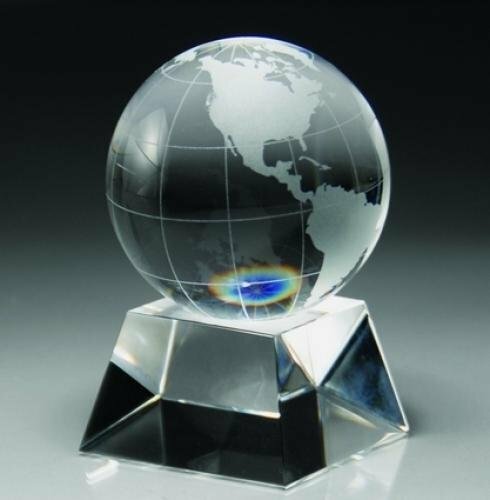 Crystal Globe Pedestal Award is an elegant choice for a crystal award or personalized gift. It is an excellent choice for recognizing the achievements and accomplishments of special people and outstanding business partners. The crystal trophy comes with a diamond engraved silver aluminum plate. The Globe Tower is an elegant choice for a crystal award or personalized gift. This optical crstal award is laser engraved and sandblasted creating a uniquely beautiful award.